Does anyone make an f150 snorkel? If so do you know where I could find one? I have them on my honda 650 rincon, and want one for my truck too. Please let me know.. I checked safari, and could only find them for the bigger fords. Well this does not refer to exhaust, its more of an "aftermarket Exhaust & Intake" section question. Wow.... That thing is a major eyesore!!! Of course i have no idea what it is either haha sorry. Last edited by DanF150; 10-07-2008 at 12:47 AM. where u plan on takin this bad boy ? I am guessing that snorkels are not something that is regularly installed on this site eh? Anyone point me in the direction of a f150 snorkel manufacturer? i dont think an f150 will float like that, but u sure can try! post up some pics of the messed up interior when you do. A friend in high school had a bit of extra money, so his parents bought him a Range Rover (newly used) which comes with a snorkel from the factory. Three days after getting the thing, he decided to mount the snorkel and drive across the Raritan River in NJ. After he was done and the thing dried out, it smelled like @$%#... and he was pissed, so he took it back to the dealer and argued about how they didnt tell him about the stink, and he wanted something else instead. The dealer obliged, and he got a new Land Rover Discovery in it's place. Needless to say, he never tried the Raritan River stunt again. Last edited by DangerRanger321; 10-07-2008 at 09:13 PM. I've been wanting a snorkel on my F150 for years. Mine had to have an engine replaced after running through one little ditch! I think I paid between $7K and $8K for that. Crazy. I just didn't realize that the air intake wasn't near the top of the engine compartment. Seems like most F150 owners don't think snorkels look good but I think snorkels look awesome on any 4X4 off roading vehicle...evan a Subaru's appearance can be greatly improved with a snorkel! SU-bah-ROOOOOOO! LOL! I don't know if that F250 snorkel you've posted a pic of would fit the outside of the F150...I'm not a mechanic and, if you can't tell by my lack of knowledge pertaining to air intake, I'm not even garage literate. However, I wonder if you could take that one and then customize fittings under the hood to make it work. Or, there are universal snorkels, like this one https://www.airaid.com/search/produc...=FREEAIRAIDHAT. I've come across a few sites showing the "plumbing" so to speak. Basically they are kits with pieces of plastic that can be cut to fit the under the hood area and then...glued I am guessing....so that it is all water tight. I realize this post is 10 years old. BUT, this appears to be an unresloved question that I continue to see in forums. 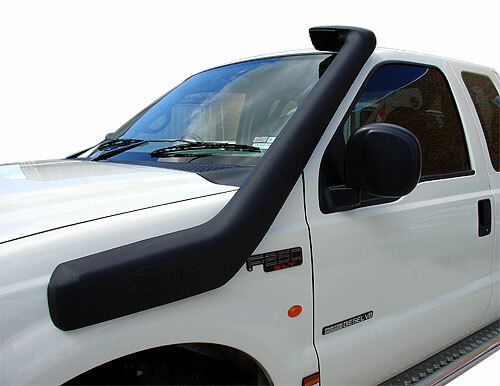 So, I hereby BUMP this thread in hopes that someone can post a link to an after market snorkel that will fit an F150...which I think would LOOK PRETTY SWEET! You can make a snorkel easily by using some SCH40, black spray paint, and some fittings. Then mount it up with some stick on u-bolt clamps. If one wants to drive in deep mud or water, then one doesn't care about the truck and then I could see one wanting a snorkel …. so then one should maybe make one from 3" plumbing parts … like racers do / did? Thread started long ago, but people ask still. Last edited by tbear853; 09-13-2018 at 11:29 PM. =leftI am also looking for a snorkel for my f150.